"in league with the law"
Tonight was the rehearsal dinner for Auntie Sue's wedding and all the out of townies as well as us wedding partiers were there. The most adorable was her former roommate's eight-year-old daughter who told us a joke she made up herself and told us in her 8 yr old english accent. "What do you call a flea that's in league with the law?" 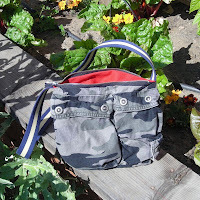 At the Maker Faire swap over a year ago, I picked up a pair of boys cargo shorts with the idea of turning the pockets into a bag. Well I finally got around to it! I cut off the leg and ripped the hem to get a little extra material. This gave enough space to do a gusseted bottom. I lined it with red cotton duck, which is pretty stiff and helps keep the shape. The heavy duty zipper and belt/strap are both from the East Bay Depot for Creative Reuse (one zipper down, 231 to go). I've never made a bag like this before and I learned a lot about what not to do. 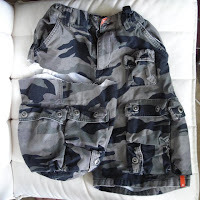 For example, I sewed in the zipper before attaching the strap = difficult. I may make a tutorial for the second leg; that is, if that one goes significantly more smoothly. The problem with multi-colored yarn. 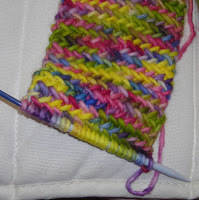 Why do some multi-colored yarns look fantastic after knitting and some look like color barf? Its hard to tell by just looking at the ball. Exhibit A: multi-colored yarn by Malabrigo Yarn that I used to knit a herringbone stitch scarf (aka My So-Called Scarf). This I like. Exhibit B: yarn by Three Sheep Yarn striped with solid purple that looks like barf. Ok maybe its not that bad, but I'm less than happy with it. And its supposed to be a gift, so that make me madder at it. Nonetheless, I was really attracted to the yarn ball in the store. One indicator might be the length of each color. For example in Exhibit A I got a couple stitches in each color before it changed. 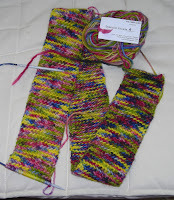 With the Afghan yarn, sometimes I get just one stitch and then its another color. Maybe I'm just unhappy with the color palette. 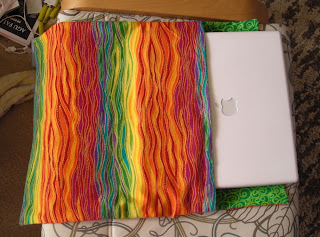 How do other people evaluate multi-colored yarns before buying them? I thought I would start doing things like reviewing books I read and maybe movies. I'm not sure how to start, so I'll do it like the kids on Reading Rainbow (add your own da-da DA! at the end). 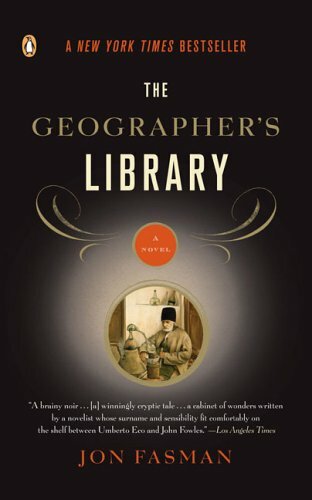 If you thought The Da Vinci Code was engaging, but ultimately vapid, you may enjoy The Geographer's Library by John Fasman. The books alternates between the main story or a small town journalist trying to write an obituary for a man who dies mysteriously and the histories of objects stolen from a medieval alchemist's lab. It's been a while since I read a book I really wanted to pick back up each day. The writing was engaging and the characters felt real and their reactions to their situations felt realistic, which is all I ask for in any story. The main character is a recent college grad that's not sure what to do with himself or how to get out of his college head-space. He's stuck in a little town in New England full of appropriately odd and lonely characters until the obituary assignment breaks the monotony. 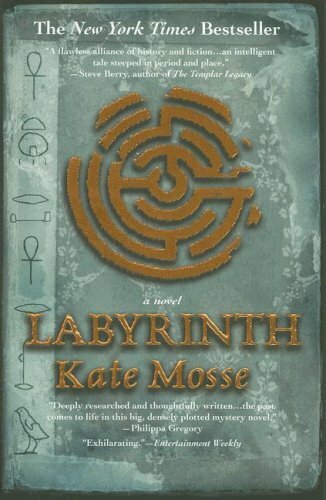 Because I enjoyed reading it so much, I was kind of disappointed by the ending (is it bad to talk about the ending in a review?). It just kind of stopped. It was a little like an episode of Lost, all build-up and little pay-off. And either the twist was totally obvious, or it supposed to be something else and it just wasn't well set up (or there wasn't supposed to be a twist). Overall I can give this book only a luke warm recommendation, even though I thought it was great while I was reading it. I'd be interested to hear from anyone who's read this a really liked it. Or who had a different impression of the ending. As some of you know, I'm not big on knitted food. Put eyes on it and call it amigurumi if you want. But food isn't usually cuddly, so I just don't get putting it in knitted form. Generally it just makes me sad, cuz I can't eat it. Well, I'm officially calling this re-post by Craft magazine the saddest craft in the world. It looks like steak, but its paper! I guess it's high in fiber. Perhaps it's a statement: kill trees, not cows. This weekend a bunch of us went up to Abby's parent's house in the Sonoma Valley to craft and eat and hang out. 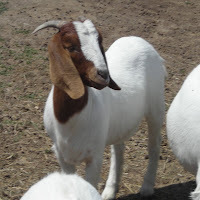 While there we went to a nearby Alpaca Farm that Abby just found out existed. Sarah (green shirt) was sooo nice to let us come over and admire the adorable alpacas and surprisingly adorable goats. 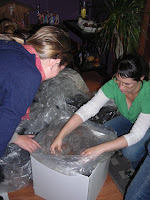 Afterwards she showed us the fleeces yet to be sorted, they were super soft and lovely. 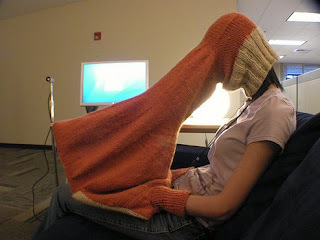 I just had to share this, I found it on Gizmodo. I'd love to see that sitting in Moscone Center next December. Well I can consider myself done with the herringbone scarf (aka "my so-called scarf"). I finally put the fringe on and marked it complete on ravelry. You can also see an awkward self-portrait in bathroom mirror on ravelry. 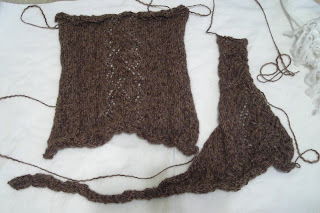 I'm also making progress on the wrap sweater, the back and right side are done; this will be my first adult's sweater. It's been quick so far, though that tends to be my famous last words. My last sweater is still sitting in my cabinet; I wonder if I'll ever get back to it. I made the mistake of using yarn I didn't totally like, and a sweater's too much time to spend with yarn you don't really like. 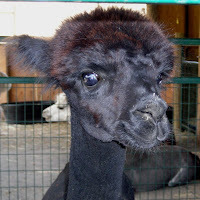 Anyway, this yarn is better; its an alpaca blend. I just hope the lace pattern stands out nicely once its blocked. 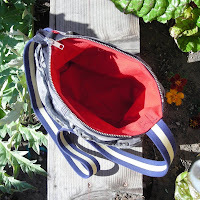 Today I finally did a project I've been meaning to get to for a long time, the snot pocket. Handkerchiefs are cute, easier on your nose and less wasteful, but unfortunately you have to continue to carry them around after you've used them. 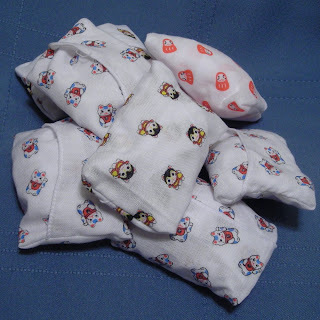 For these I sewed up a corner of the hanky so it will fold into its own pocket. 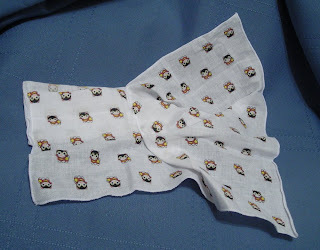 I can't wait to make more and with better hankies; these are cute and from Daiso, but have a gigantic weave. I also kind of want a stamp or something to mark them as snot pockets. 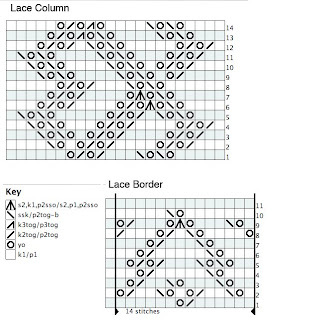 I was looking to translate some dense Vogue knitting instructions to a chart, and since getting a pen and paper is anathema to my computer-addicted soul, I went looking online instead. And I found this neat java application KnitChart. It has a bunch of symbols that you can click on to fill out the grid and a lot of good useful features like charting back and forth or in the round and designating repeats. The only drawback right now is that it can't be saved (at least not with safari), so you have to take a screenshot. After some futzing in photoshop, I was able to produce the chart on the left. I'm a sukka for lolcats; very unhip, I know. But I have an entry for the icanhascheezburger.com contest for a trip to Vegas and I reckon if all three of the people who read this blog go over and rate it five stars, I have a real shot. Just click on the kitty. Thanks! My Sawyer nickname is "Mathboy". Not his best effort. His second tries were "Grimace" and "Pud", which frankly, I don't get. I changed my name to an obvious girl's name and got "huckleberry pinhead" which might be my favorite.